Solid surface showers are simple to clean and maintain. You don't have to put in any backbreaking work like you would with fiberglass and other less sturdy materials. 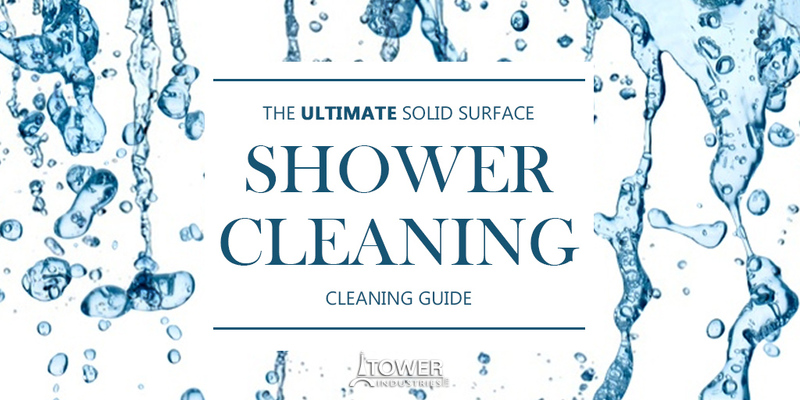 Here are 3 steps to keeping your solid surface shower clean: Always test the cleaner in an inconspicuous spot to ensure that the chemicals will not damage the surface. Solid surface materials, including Meridian shower panels and bases, can be cleaned with water and your regular household cleaners. You want to stick with nonabrasive cleaners for smooth surface finishes. When cleaning showers that have a matte finish, you can use a mild abrasive cleaner. Always test the cleaner in an inconspicuous spot to ensure that the chemicals will not damage the surface. Once you have scrubbed the surface, simply rinse the cleaner off with water. Matte-finished solid surface showers can last for decades when properly taken care of, yet occasionally you may get a stain on the surface or an abrasion from regular daily use. You can buff these issues away using a regular scouring pad. We recommend Scotch Brite Scouring Pads as you can find green, maroon and white ones at your local grocery store, retail store, or online store. You want to stick with nonabrasive cleaners for smooth surface finishes. There is nothing worse than dropping a brand new shower head on the floor and seeing a deep gouge in the solid surface materials. Luckily, you can sand scratches and gouges out using 220 grit and 320 grit sandpaper. Perform the following steps for the Meridian solid surface shower (please note that this method is not to be used on non-slip pebble-textured surfaces as it will remove the non-slip coating). Never use sealers, waxes, penetrants or any other topical treatments on your Meridian solid surface shower. Always check the information on regular cleaners to see if they are wax-based or contain any sealers and penetrants. With solid surface shower systems, cleaning and upkeep are a breeze. The reason is that solid surface materials are nonporous, increasing their stain-resistant capabilities. In addition, solid surface wall panels are installed without the use of grout that is needed when placing regular tile. So soap scum, calcium buildup, grime, and mildew doesn't form between the edges. With just a bit of cleaning and upkeep, you will have a beautiful shower for many years. From slipping and falling to fungus and bacteria in hospital showers, the right shower surface can affect these concerns dramatically!